Patients with mental health concerns who are no longer treated by specialized occupational therapy units must work with therapists who have an understanding of mental illness and how it can affect treatment. 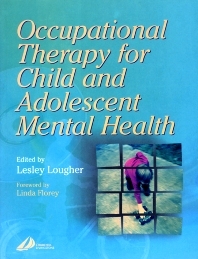 This textbook provides occupational therapists with a theoretical framework for working with clients with mental health problems. This specifically includes children and adolescents. Key concepts are linked directly to clinical application, making this an ideal source for students and practitioners. Introduction to child and adolescent mental health services. Development of occupational therapy in child and adolescent health services. Problems and disorders. Child development . Attachment theory. The therapeutic use of play. Family therapy, systems theory and the model of human occupation. Psychodynamic theories. Infants and young children. Occupational therapy with school age children. Occupational therapy in child and adolescent psychiatry . Child psychiatry in the USA. Child Adolescent and family occupational therapy services in Aotearoa, New Zealand. Supervision. Protective legislation for children .